The modern tendency to restrict international arbitration to matters of commerce and investment is succumbing to a renewed recognition of the original impetus for dispute resolution by arbitration – i.e., matters of public international law, most importantly the settlement of disputes that pose a threat of international conflict. Recent developments suggest a renaissance of public international arbitration, most clearly manifested in the present flourishing of the Permanent Court of Arbitration (PCA), the oldest existing dispute settlement institution in international law. proposals to increase the PCA’s activities in future and to sustain and enhance the institution’s ongoing revitalization. A very useful Practitioner’s Guide provides an overview of the PCA’s various services and the best means of accessing them, along with a summary of the key provisions of the new PCA Arbitration Rules 2012. For lawyers who are involved in dispute resolution proceedings, there can be little doubt about the PCA’s relevance. This book is at once an academic work, indispensable for scholars of the institution, and a practical guide that will be a required addition to the libraries of counsel, arbitrators, and others involved in dispute resolution proceedings conducted at the PCA. Foreword by Brooks W. Daly. 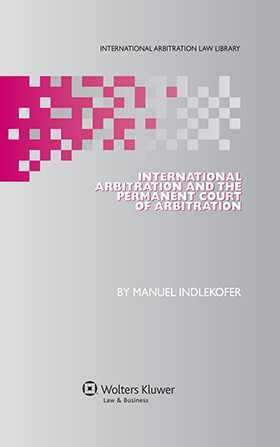 Chapter 1 Roots of Public International Arbitration and the Permanent Court of Arbitration. Chapter 2 Public International Arbitration in Today’s Dispute Settlement Framework. Chapter 3 Today’s Activities of the Permanent Court of Arbitration. Chapter 4 Prospects for International Arbitration and the PCA in the Twenty-First Century. ANNEX I Inter-State and Inter-State Related Arbitral Proceedings since 1945.